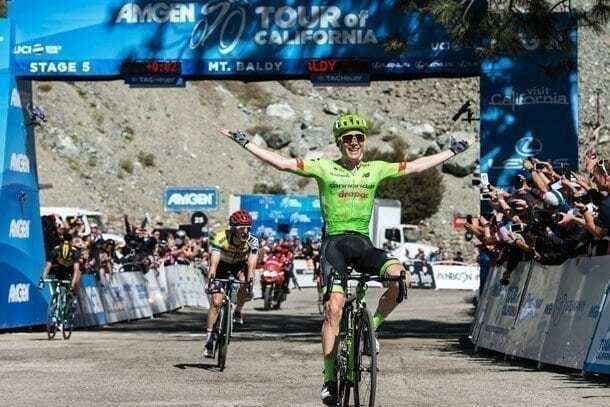 It was an uphill battle – literally – for the race lead at today’s Amgen Tour of California, with Cannondale-Drapac Pro Cycling Team’s 2015 Time Trial National Champion Andrew Talansky taking his first career California stage win and gaining valuable seconds on race leader Rafal Majka (POL) of BORA-hansgrohe heading into tomorrow’s time trial. With the top-3 overall race leaders separated by seconds, Majka controlled a flurry of uphill attacks to the finish and put a little more distance between those overall times. 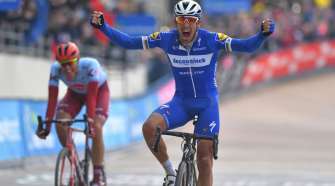 “Once we were inside that last kilometer, I thought about winning the stage rather than just continuing to attack, and that worked out pretty well. I do know this finish, which was definitely an advantage, so it worked out,” said Talansky. Stage 5 presented by Lexus took the cyclists 77.9 miles from Ontario to the top of Mt. Baldy for the third time in race history. The Queen Stage of this year’s race included a whopping 12,000 feet of elevation gain during the nearly 4-hour ride. A perennial fan-favorite finish, crowds lined the steep 10-mile incline of Mt. Baldy (8.5% average gradient with some sections kicking up to 15%) as the riders contested 15 switchbacks to the finish line. In the lead group climbing to the summit with Talansky (Napa, Calif.) and Majka were the remaining top-3 general classification leaders: Team LottoNL-Jumbo’s George Bennett (NZL) and Team Sky’s Ian Boswell (Bend, Oregon), who bridged to the group in the final mile. The group traded attacks over the final couple of miles, and it looked for a moment like one from Majka with under a mile to go would stick. But the group eventually responded and into the final corner, it was Talansky and Majka, with the Californian pulling ahead into the final curve and over the finish line. With today’s stage win, Talansky jumped from 8th to 4th place and pulled several seconds closer (+:44) to Majka, who increased his lead slightly over Bennett (who lost four seconds, now at +:06) and Boswell (who lost 11 seconds, now at +:25). With just seconds separating the leaders, tomorrow’s time trial may play a decisive role in determining the race champion. “It’s the first time I did this finish, and it’s not easy. In the end, second place is also great, and I still keep the yellow jersey, and we took some times from other riders, and tomorrow is the time trial, and I have some seconds. 24 kilometers is not easy, and it’s a little bit different when you start that distance at 2000 meters (elevation),” said Majka. Others on the overall top-10 leaderboard stuck close behind the lead group, digging hard to ensure the race stayed within reach, including Team Dimension Data’s Lachlan Morton (AUS) who now sits in fifth place 49 seconds off the race lead; BMC Racing’s Brent Bookwalter (USA), who is in sixth overall and +1.02 back; followed by Team Sunweb’s Sam Oomen (NED); Team LottoNL-Jumbo’s Robert Gesink (NED); and Team Sky’s Tao Geoghegan Hart (GBR). 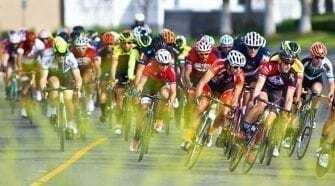 An early breakaway of 15 riders included BORA-hansgrohe’s World Champion and Visit California Sprint Jersey wearer Peter Sagan (SVK) riding up front and protecting teammate and Amgen Race Leader Jersey wearer Majka. Three of yesterday’s 100-mile+ breakaway riders again found their way into the lead group: Rally Cycling’s first and second-place stage finishers Evan Huffman (El Dorado Hills, Calif.) and Rob Britton (CAN), and UnitedHealthcare Pro Cycling Team’s Daniel Jaramillo (COL) wearing the Lexus King of the Mountain (KOM) Jersey. Britton attacked on the second KOM of the day at Glendora Mountain Road and was followed by Team Sky’s Peter Kennaugh (GBR). Britton rode out to a solo lead that was just one minute over Kennaugh, two minutes over the chase group, and nearly three minutes over the main field at the crest of the second KOM with less than 20 – mostly uphill – miles left to ride. Team LottoNL-Jumbo drove the chase pace hoping to help teammate George Bennett (NZL) gain the two seconds needed to catch the race leader. By the final KOM at Mt. Baldy, Kennaugh had been reabsorbed and Britton’s solo lead began waning until he was caught by the Talansky-led chase group with just under 3.5 miles to go. Britton’s uphill solo ride at the front, following a long day in the breakaway yesterday, won him today’s Breakaway from Cancer® / Breakaway from Heart DiseaseTM Most Courageous Rider Jersey, which teammate Evan Huffman wore going into the stage. No other leader jerseys changed hands today. The 14.9-mile course for tomorrow’s Stage 6 presented by Lexus in Big Bear Lake will be the race’s first time trial at elevation (6,700+ feet above sea level). 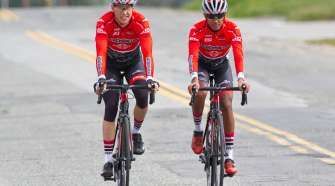 The 2017 Amgen Tour of California will conclude Saturday in Pasadena.